Zimbabwe’s ground breaking national HIV survey will see up to 16 laboratories dotted across the country, 13 of which are State owned, upgraded at a cost of $5 million by the time the process starts. Speaking at the official launch of the six month long Zimbabwe Population Based HIV Impact Assessment (ZIMPHIA) in Harare yesterday, ICAP at Columbia University chief of party, Dr Godfrey Musuku, said the laboratories targeted for upgrading were Parirenyatwa, Mpilo, Gokwe, Gweru, Guruve, Gwanda, Karoi, Mutoko, Hwange, Mutare, Masvingo and Beitbridge. Dr Musuku said they would also procure 27 pima machines (used for CD4 count testing) and 45 height boards and scales (for growth monitoring), which would be distributed to clinics and hospitals across the country. He said 20, 4 x4 double cab vehicles had also been procured for use during the survey. Dr Musuku said the vehicles and all the equipment would be handed over to Government at the end of the six months survey period. About 30 000 people randomly selected are expected to go through voluntary counselling and testing for HIV as well as syphilis by the end of the programme. “This equipment is meant to prepare the laboratories to handle samples and the huge workload that might arise during the survey,” said Dr Musuku. Officially launching Zimphia, Health and Child Care Minister Dr David Parirenyatwa, said while the survey was key to ascertaining the country’s HIV and syphilis burden, it would also enhance the country’s health delivery system. “Zimphia will go a long way in strengthening our health delivery system. In fact, it will enhance a lot of our programmes,” said Dr Parirenyatwa. Dr Parirenyatwa said he was also positive that some of the over 2 000 nurses currently out of employment would be absorbed during the survey. He said his Ministry was anxious for the Zimphia results as past surveys have portrayed Zimbabwe’s HIV burden as going down. 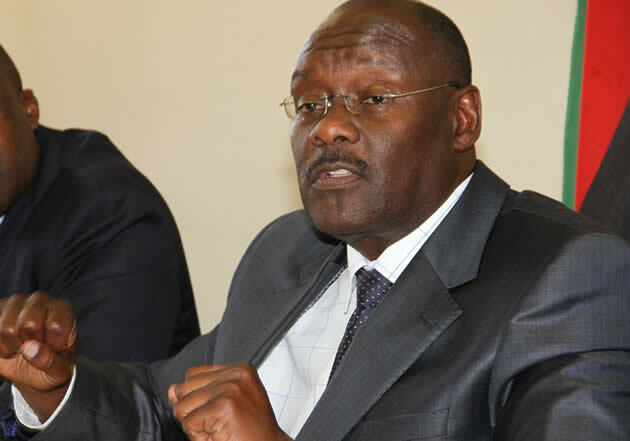 “Zimphia will give us a true picture of the burden of HIV in the country and I hope it will confirm a lower figure of HIV prevalence currently estimated to be at 15 percent,” said Dr Parirenyatwa. He said while current surveys have shown that the country had gone a long way in reducing the burden of HIV, a lot still needed to be done to achieve the United Nations ambitious target of providing ARVs to at least 90 percent of all those diagnosed; having 90 percent of those that are HIV positive know their status and, having at least 90 percent of all people receiving anti-retroviral treatment having viral suppression by the year 2020. Dr Parirenyatwa thanked the United States Centre for Disease Control (CDC), the Global Fund and other partners for providing financial resources that would enable the country conduct the ground breaking survey and in the process, contributing extensively to the country’s health delivery system. “Undertaking Zimphia is a major task that requires huge sums of money and I would like to thank the US Government for providing significant funding to this project under the US President’’s Emergency Plan for Aids Relief (PEPFAR) through CDC, “ he said. Speaking at the same occasion, deputy chief of mission with the US Embassy Mr Robert Scott, said his Government had availed $8 million for the whole programme. He said $5 million was meant to strengthen the health and laboratory systems while $3 million would go towards the actual survey. He said in the coming year, PEPFAR would invest a total of $103 million in Zimbabwe to work towards HIV interventions. Mr Scott said his Government was committed to assisting the country achieve its set targets. He said Zimbabwe’s experiences during Zimphia would provide a template for 19 other similar surveys that the US would be assisting other African country’s to conduct. “Not only will Zimphia advance HIV insights, programming and policy in Zimbabwe, it will also serve as a template and example for other African countries that will conduct similar surveys in the coming years,” he said. President of the chief’s council Chief Fortune Charumbira promised to give Zimphia full support through all existing traditional structures. “We will be there to encourage the villagers to participate in this survey, remove fear and inspire them to own the process through our structures,” he said.